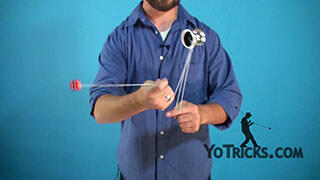 Learn how to perform the freehand yoyo trick Shoulder Pop. 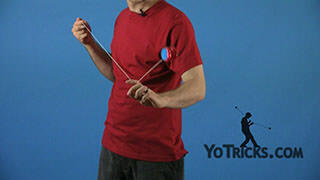 Shoulder pop starts with a one hand undermount. 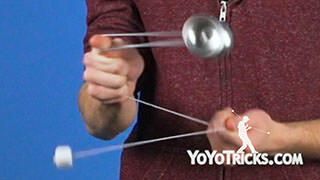 To do that trick, first you are going to start with a frontstyle throw. 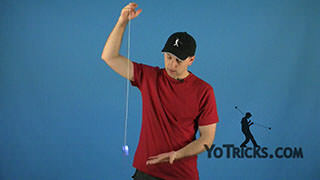 Then you want to swing the yoyo forward in front of you until the string is just about parallel with the ground, or just a little underneath parallel. 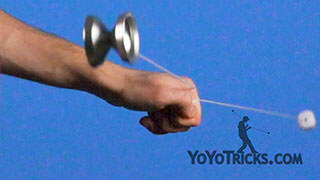 Once the yoyo has reached the apex of its swing, you want to loosen your grip on the counterweight in your throwhand. Then pull your throwhand back, which is going to propel the counterweight from the back of your hand, swinging forwards underneath the yoyo and landing into your throwhand. 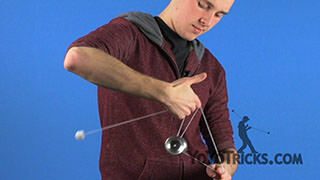 One hand undermount is actually pretty difficult to hit when you are first starting 5A, so we have got some tips for you. 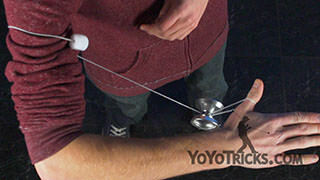 If you find that the counterweight is missing to the inside, or to the outside of the yoyo, then you want to really take a look at how you are pulling your throwhand back. 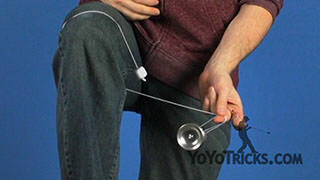 You really want to make sure that when you pull back it is perfectly straight in line with the yoyo so that the counterweight string can go into the gap. 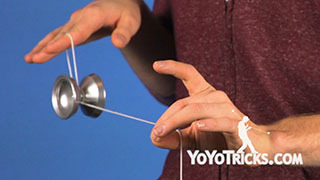 If you find that the yoyo is dropping as the counterweight is swinging, then you are going to want to pinch the string as your hand slides down the string, just to make sure that the yoyo does not fall. You can pinch the string either between your thumb and your pointer finger, or just by curling your pointer finger all the way in. 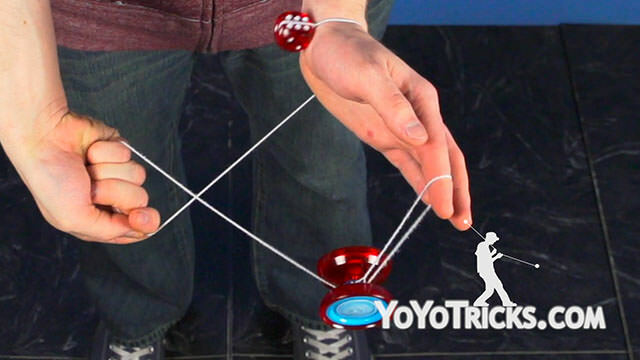 If you find that the counterweight does not have quite enough string to make it into your throwhand, then your problem lies in your string proportions. 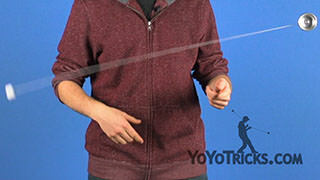 When you are first sliding your throwhand down the string at the beginning of this trick, you want to make sure to slide it two thirds of the way down the string, so that the counterweight has enough string to come into the gap of the yoyo. 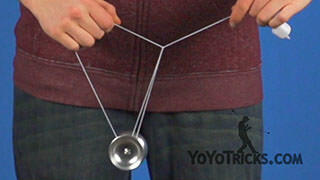 You will see in this ending mount that the string is in three segments. 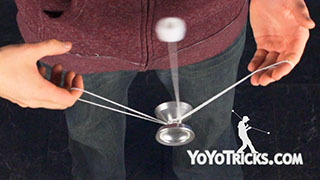 You need two thirds of the length of the string on the counterweight, and one third of the length of the string on the yoyo. 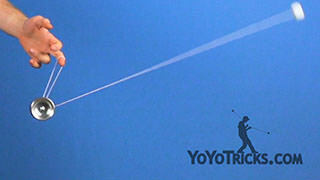 Keep practicing the one hand undermount. 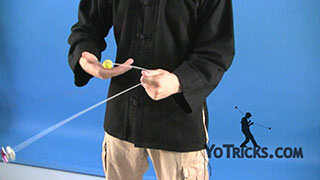 It is tricky to hit, but once you have mastered it, we can move on to the next part of the trick, which is the shoudler pop. 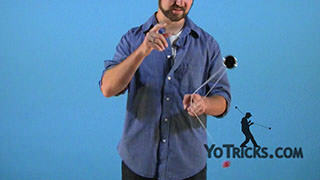 To do the shoulder pop, you want to swing the yoyo toward yourself in a pinwheel motion. 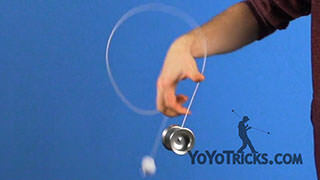 After the yoyo has come over your throwarm forearm, then you want to let go of the counterweight and the momentum of the yoyo is going to pull the counterweight around, separating the yoyo and the counterweight, coming over and tapping your throwarm. 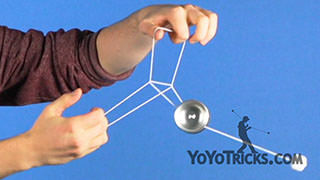 Rebounding off in the opposite direction, coming back underneath the yoyo where you can catch the counterweight. You will see that you are back right where you started. So you can just do the shoulder pop over and over as many times as your heart desires. 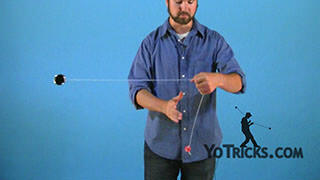 If you are having trouble with this, do not forget to pinch the string near the yoyo while the counterweight is rebounding off of your throwarm. 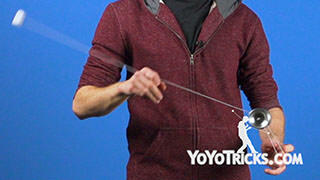 That will keep the string from sliding through your fingers, just like how we did in the first step with the one handed undermount. 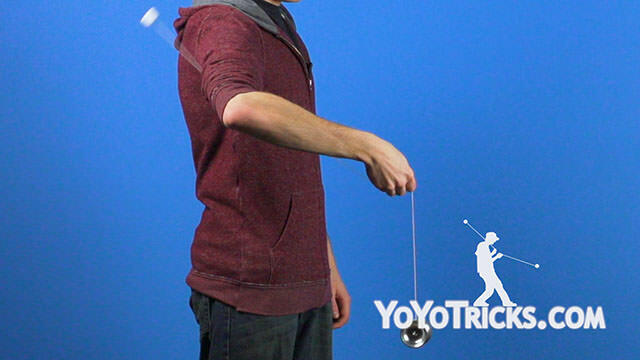 Once you are done doing that, now to dismount from the trick we can either just drop the yoyo and do a bind, or we can do a trick called Nunchuck. 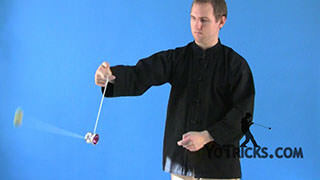 Nunchuck looks like this. Rather than having the counterweight rebound off of your arm, instead you are going to take your opposite hand and catch the counterweight as it comes over. 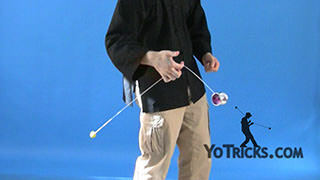 Then you just want to let go with your throwhand and then pull your opposite hand down, bringing the yoyo all the way around. 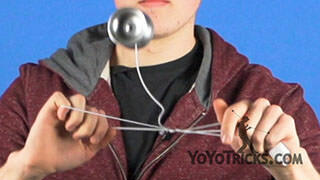 From there you can land the yoyo into a backspin mount, and perform a bind. And that is Shoulder Pop. 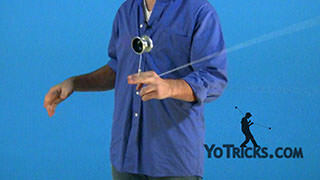 If you find that the counterweight does not have enough string to go to your throwhand, then your string proportions are likely incorrect. So when you are sliding your hand down the string, you just want to make sure that your throwhand is about… I did a breakaway.